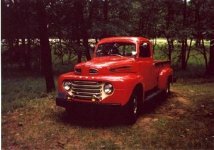 and other pre-1960 trucks, trucks with "Fat Fenders"
This is one of my truck projects. It's actually going to be two trucks in. 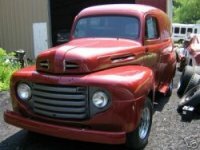 I first bought the '51 F-4 in the spring of 2004. 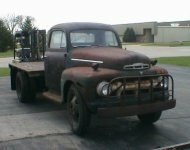 I later bought the '48 F-4, I am switching the '48 sheetmetal to the '51 chassis because I like the "Monkey Face" sheet metal better than the "Manure Grill". 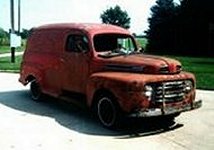 I bought my original paneltruck, on the left, in 2000 and later bought the other paneltruck on the right, which is in a lot better condition, in 2006. 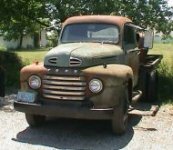 I didn't set out to find an old car, it kind of found me. I bought this car in September of 2009. All original images and text copyright ©2001 by Robert A. Jones. All rights reserved.